The Conversation Plinth, by architecture and design firm IKD, was unveiled at the 2017 Exhibit Columbus exhibition to spark conversation about historic Columbus and hardwood CLT. 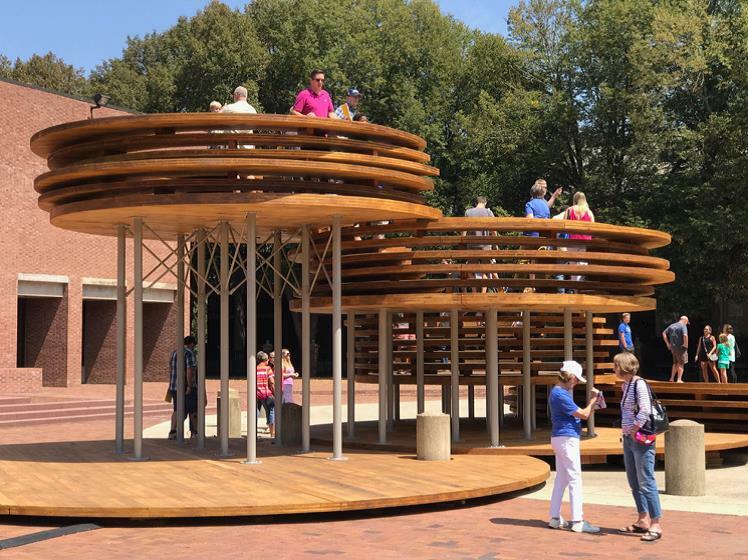 Settled in the main plaza of Columbus, Indiana, is the first hardwood Cross Laminated (HCLT) structure in the United States. Christened the ‘Conversation Plinth’, the structure was created by architecture and design firm IKD; it was revealed to the public at the 2017 Exhibit Columbus exhibition, which is an annual event that takes place in Columbus to explore architecture, art, design and community within the city. The Conversation Plinth aims to celebrate the people of Columbus whilst also paying homage to the city's past revolutionaries of design, who include J. Irwin Miller. The structure takes its inspiration from the ‘conversation pit’ in the living room of the Miller House, as well as from the plinths that raise nearby landmarks - including the Cleo Rogers Memorial Library and the Large Arch (designed by Henry Moore). Coincidentally, the Plinth was awarded the Miller Prize, a competition that honors J. Irwin Miller and Xenia S. Miller by continuing with their desire to make Columbus “the best community of its size”. IKD is an architectural design firm led by Yugon Kim and Tomomi Itakura that explores the intersection of art and architecture; their hope is that the Conversation Plinth will work as a catalyst to revolutionise the timber industry, by demonstrating the viability and value of hardwood CLT. As pioneers in the use of hardwood CLT in the U.S., IKD were awarded a 2017 Wood Innovation grant to develop the innovative material for both the installation and for product certification (aiming to produce the hardwood CLT on mass). 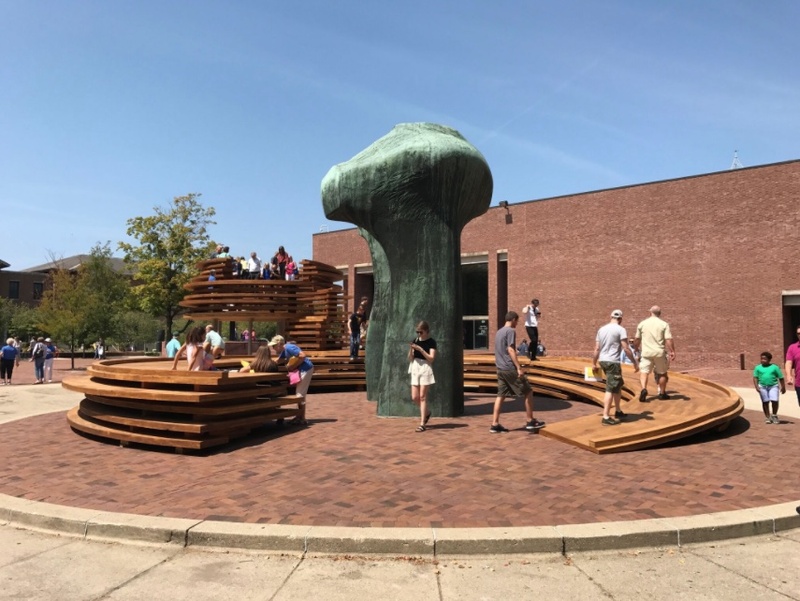 Made with large, timber disks, the Plinth encircles the Moore statue in Columbus' main plaza and rises upwards, encouraging viewers to scale it, and offering them a different perspective of the city. 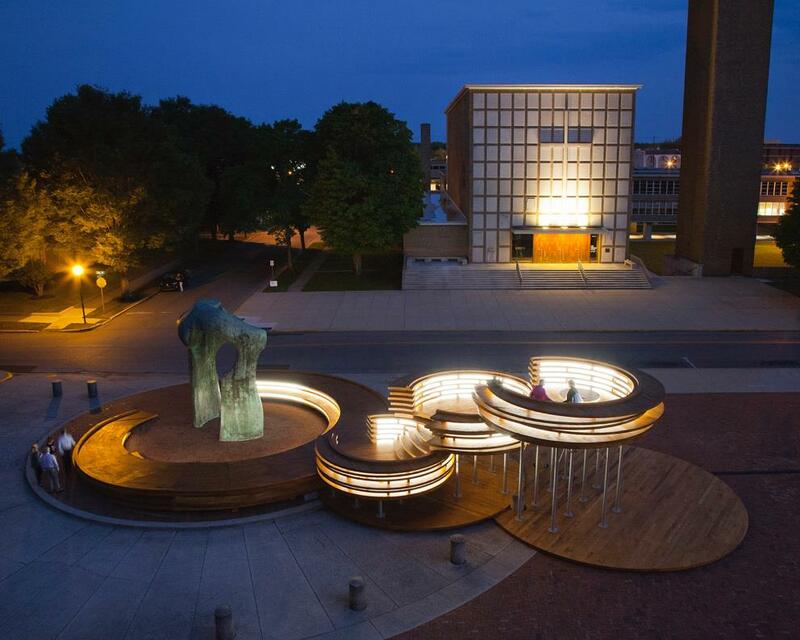 At night, the Conversation Plinth transforms the plaza and the Columbus cityscape, illuminating it with dramatic lighting set between the timber disks. The project offers a place for the community to come together to consider the design heritage of Columbus, and reflects the pioneering nature of this historic city. The 2017 Exhibit Columbus exhibition runs until November 26th.